Such mergers are --together with binary black holes-- prime candidates to be detected by terrestrial gravitational wave detectors. Such mergers are likely the 'engine' behind short gamma-ray bursts. They likely produce the heaviest elements (such as platinum or gold) in the cosmos. The radioactive decay of freshly synthesized, heavy elements causes an electromagnetic transient ("macronova") that accompanies the expected gravitational wave signal. Gravitational waves cannot be focussed and sky locations need to be inferred from (very inaccurate) triangulations. The sky location of the first gravitational wave event GW150914 was known to about 600 square degrees. For comparison the full moon in the sky has about 0.2 square degrees! Therefore, the sky location was practically unknown. An additional electromagnetic transient --a macronova-- will pin down the GW source. 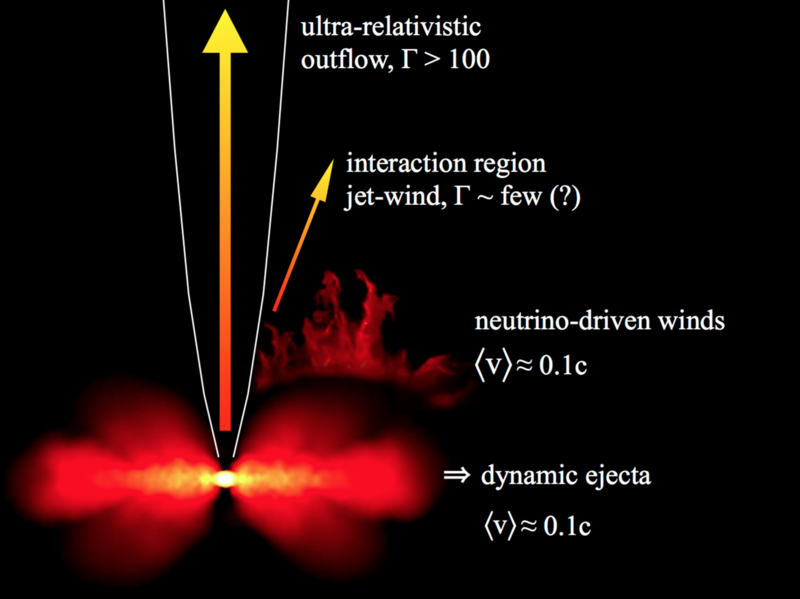 Compact binary mergers eject material via different channels: a)"dynamic ejecta" (unbound by hydrodynamic interaction and gravitational torques) and b) various types of "winds". What we subsume loosely as winds can have different physical origines, for example driven off by neutrino absorption, magnetically launched winds or by accretion disk matter that becomes unbound by viscous and nuclear heating. These channels are sketched in the following figure (Rosswog, Philosophical Transactions of the Royal Society A, 2013; arXiv:1210.6549). Dynamic and wind ejecta differ in their "electron fractions Ye" (number of electrons per nucleon= number of protons per nucleon): dynamic ejecta have very low Ye (~0.1) while wind ejecta have a distribution of Ye around 0.3. But any standard, both channels eject extremely neutron-rich matter. 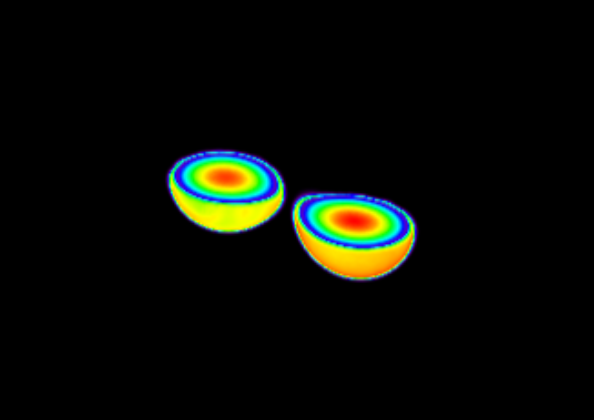 An example for dynamic ejecta from two neutron stars with 1.4 and 1.5 solar masses are shown the following movie (click on following figure). Colour coded is the electron fraction of neutron star matter. The ejecta of compact binary mergers are primary sites where the heaviest elements in the cosmos are forged. These ejecta are very different from any other cosmic explosion we know: while supernovae produce elements up to the iron group near Z = 26, the dynamic ejecta of neutron star mergers consist entirely of rapid-neutron capture ("r-process") elements up to the third ("platinum") peak near Z = 90, and should thus leave a distinctive imprint on the observable electromagnetic display. While both channels produce heavy elements via r-process, there are substantial differences which are displayed in the following figures. S. Rosswog, U. Feindt, O. Korobkin, M.-R. Wu, J. Sollerman, A. Goobar, G. Martinez-Pinedo (2017), accepted for publication in Classical and Quantum Gravity (2017). We have in particular explored how much (not so well known) nuclear physics close to the neutron dripline can influence the detectability of macronovae. And the short answer is: a lot! Using the Duflo-Zuker mass formula ("DZ31") yields about one order of magnitude larger heating rate than the so-called "Finite Range Droplet Model" ("FRDM"), please see the above paper for more details. are available at this dedicated website. for all explored cases can be downloaded from Ulrich Feindt's Github page. A "best-guess neutron star neutron star system" with 1.3 and 1.3 solar masses. This is expected to a very common type of neutron star binary system (run 'N2' in the paper). 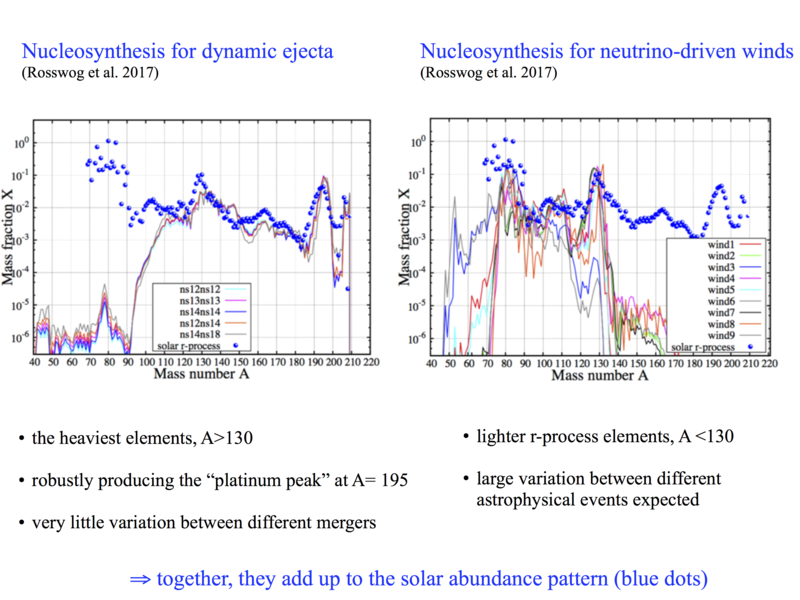 A slightly more extreme neutron star system with 1.4 and 1.8 solar masses (run 'N5' in the paper). Although, probably slightly less common, there are two observed neutron star systems with a very similar mass ratio (J0453+1559 and PSR J1913+1102). A neutron star black hole system with a 1.2 solar mass neutron star and a 7 solar mass black hole (run 'B3' in our paper). Matter ejected by unbinding an accretion torus (run 'wind 4' in the paper). column 3: flux [erg s^-1 cm^-2 Angstroem^-1]. Martin et al. 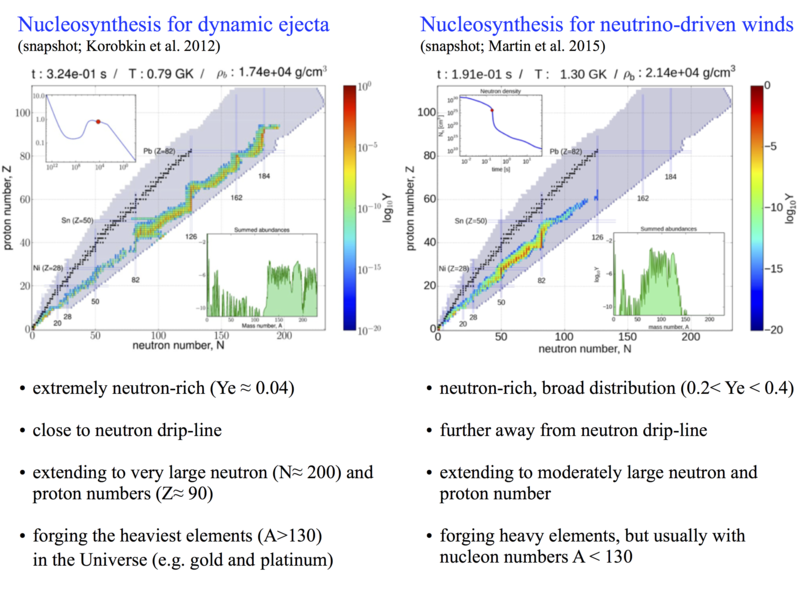 (2015), Neutrino-driven Winds in the Aftermath of a Neutron Star Merger: Nucleosynthesis and Electromagnetic Transients,The Astrophysical Journal, Volume 813, Issue 1, article id. 2, 14 pp. Rosswog (2013), The dynamic ejecta of compact object mergers and eccentric collisions, Philosophical Transactions of the Royal Society A, vol. 371, issue 1992, pp. 20120272-20120272. Classical and Quantum Gravity in press.